I decided to dedicate a post to what we call "fumetto". This can be done with fish or crustaceans, as in this case. 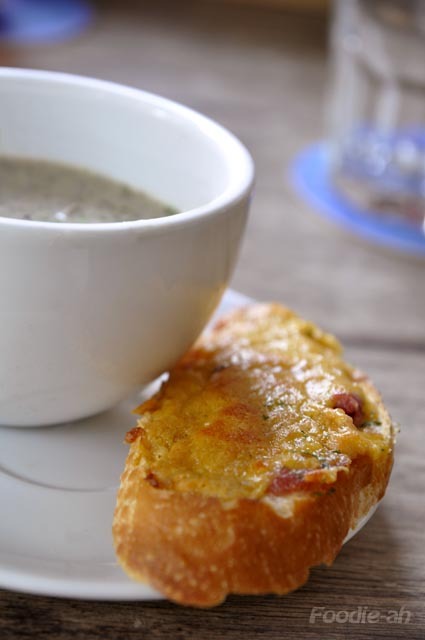 It is essentially a stock which can be used to give a delicate and natural flavor to dishes such as pasta or risotto. You can prepare this "on the fly" in about 40 minutes if needed, but I prefer to make a large amount in advance, let it boil for longer, freeze it and have it readily available when required. 1 kg of crystal prawns (any other prawns will do) - I suggest you buy these from the wet market as they are much cheaper, about $12 per kg. Peel and halve the onion, halve the whole garlic bulb, cut the celery into 4 pieces, peel the carrots and cut them lengthwise and then into 2. Peel the prawns and set aside the shells and heads. You can wash and freeze the meat. Put the carrots, onions, celery, garlic on a large non-stick saucepan with a drip of olive oil, and fry them until golden on medium-high heat. 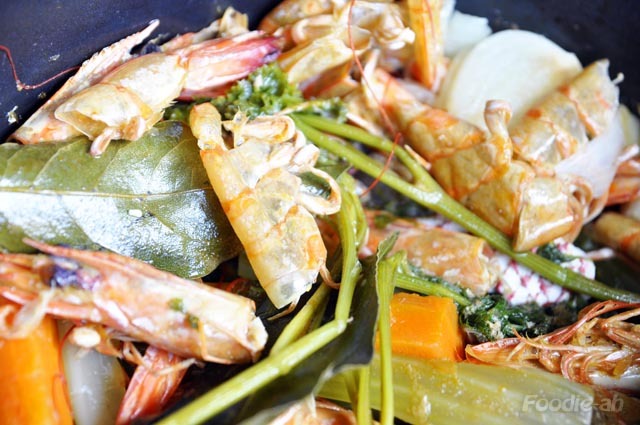 Add the prawn shells and fish bones, continue to toss until the shells are nicely coloured. Add enough cold water to cover the content of the pan, then add the bay leaves, parsley and peppercorns and cover until almost boiling. Adjust the gas so that the liquid boils as slowly as possible, and let it boil stirring occasionally for a few hours (1-3) adding cold water when necessary. Finally add the tomato concentrate, continue to boil and reduce the liquid to about a third. Remove from the gas, let it rest and strain to obtain a clear liquid. The picture shows what is left after you separate the liquid from the ingredients, which you can then discard. For convenience, you can freeze the stock by pouring it into little bags or small container of just the right size (about a cup for 2 people). Alternatively, for a quick fumetto that you need on the day, follow the same procedure but only boil for about 30-40 minutes reducing it to a third. 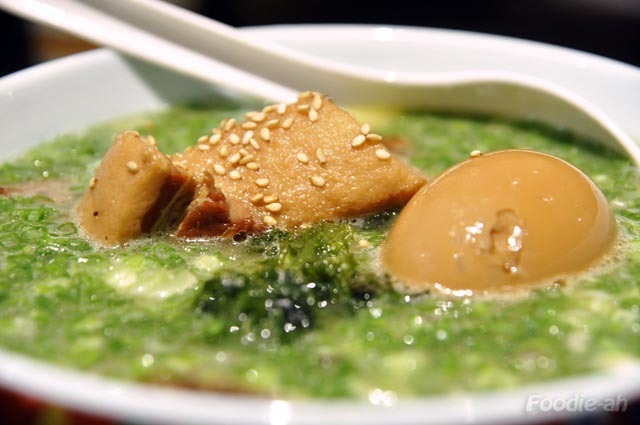 I had a crave for Ramen, and I spent quite some time researching where to go. In the end, I decided to try a little restaurant that I have been observing for quite some time and never had the opportunity to try. Marutama Ramen is located at the 3rd floor of Central, Clarke Quay. 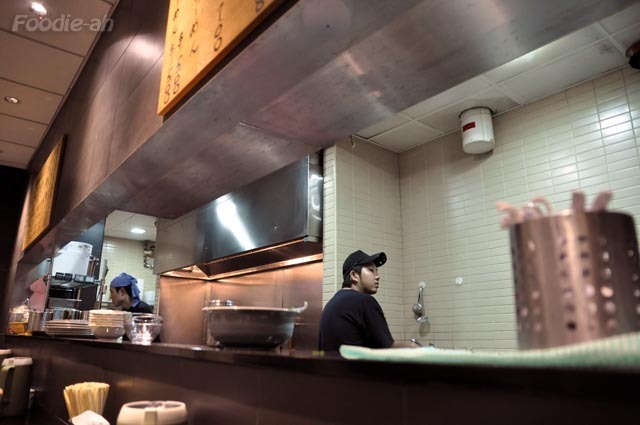 I have noticed long queues in front of this rather narrow little restaurant, and I was curious to find out what's behind its popularity. 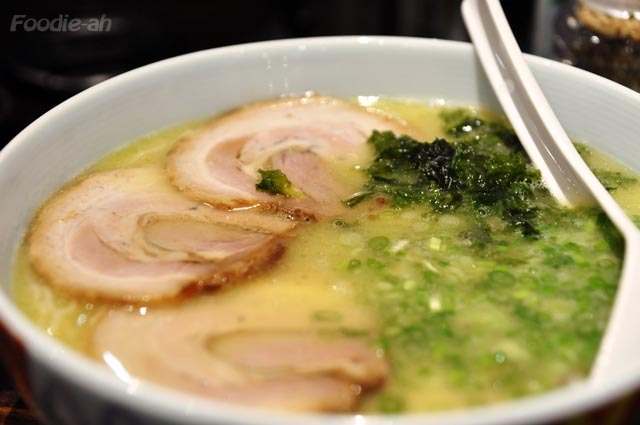 Each bowl of ramen costs $12 without any extra toppings. The Char-Siew ramen was served with 3 slices of pork, as I added the extra 2 slices for $4. Initially, I was not impressed by the noodles as they are so thin. Although I prefer more body in the noodles, I enjoyed this ramen as I ate more and more of them. The generous spring onion, seaweed, tender charsiew, all well balanced onto a very tasty soup. Some might find it salty, but this is how it's supposed to be, so that the noodles can pickup the flavour. My dining companion chose this kakuni ramen with extra Ajutsuke tamago. The egg is very tasty, slightly running inside. 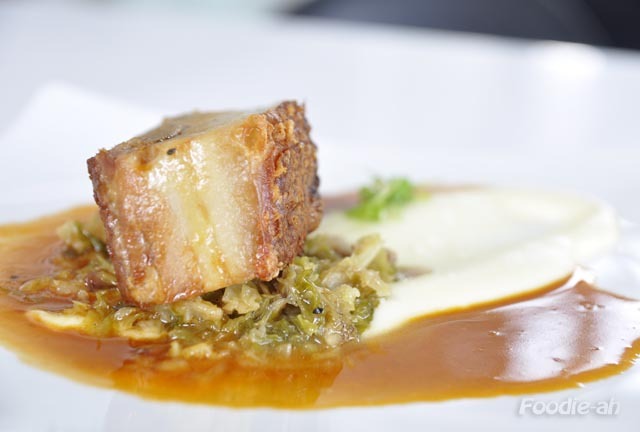 The kakuni is pork belly braised for a long time (buta kakuni), extremely tender and flavoursome. I think I am going to choose this, next time! The chef serving the ramen was actually Japanese, and I liked the fact that we ate our ramen at the counter, just like in Japan. This place is not cheap (we spent $42.35 for 2 bowls of ramen), but given that good, cheap ramen just like in Japan don't exist in Singapore, unfortunately you have to pay for quality and authenticity. I have only one negative comment to make: I with they provided a choice of thicker ramen! It's been a while since my last time I visited this restaurant, which I have already blogged about. I did like their old Sunday brunch a-la-carte buffet menu, which now has become a "tapas" menu. However this time I chose the a-la-carte lunch instead. 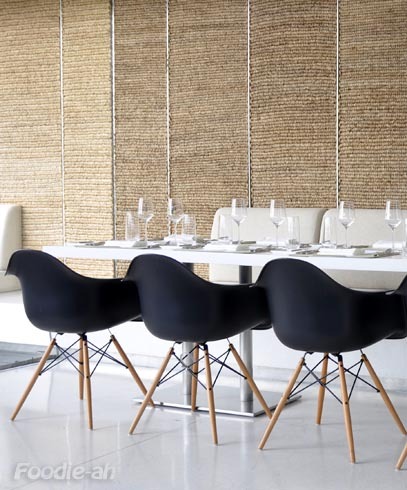 I still love their interior design, which is particularly bright and spectacular during lunchtime, when you can enjoy a view on Palawan beach. 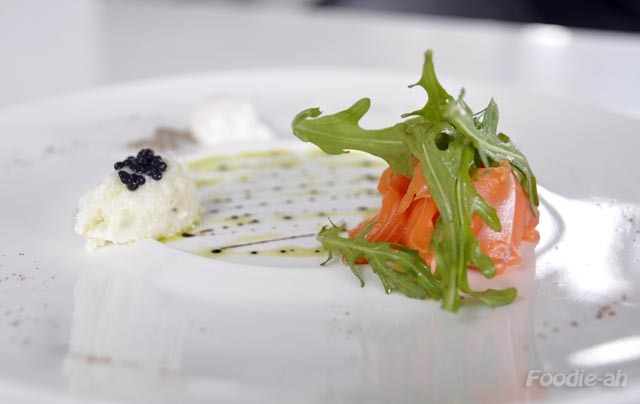 The Cod Brandade with Cured Salmon, Avruga Caviar, Poached Quail Egg and Rocket salad was not the most impressive starter. I wasn't impressed with the salmon, but the Cod Brandade was very good. 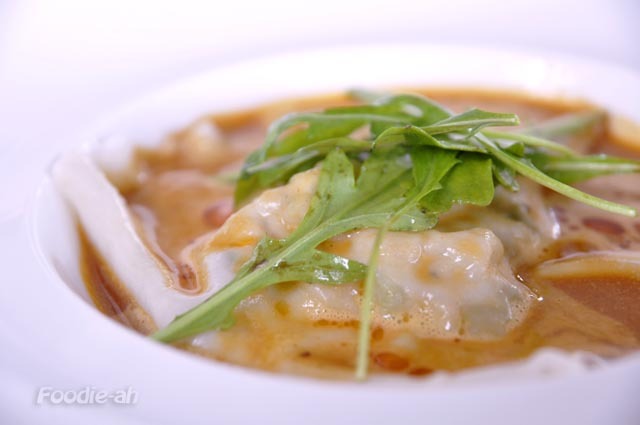 I didn't like the King Prawn Ravioli, Light Prawn Bisque with Lemongrass Chervil Veloute. The dish, although perfectly cooked, had a "food court" taste and smell. The soup that the ravioli was served with, reminded me of "mee rebus" or similar. I appreciate that this might be exactly what the chef was trying to achieve, but I am not a big fan of it, so it might just be me. While I wasn't particularly impressed by the starters, the mains were a totally different experience. The Pan Seared Kurobuta Cheek, Sweet Potato Chips, Apple Spheres and Herbs Oil was absolutely phenomenal. Since they ran out of cheek, we were served a tender piece of belly, together with its crispy roasted skin. The pork stood on a bed of finely chopped vegetables and surrounded by a tasty demigras, mashed potatoes ans mustard on the side. 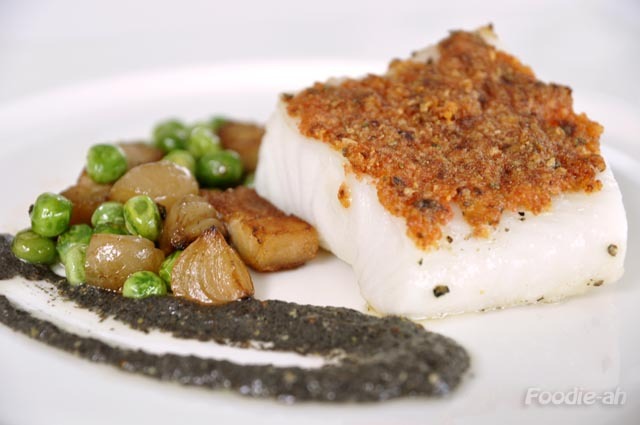 I chose a Cod Fish with Miso Crust, Lardons, Balsamic Onion, Green Pea, Served with Truffle Vinaigrette. The generous chunk of cod was perfectly cooked, extremely juicy and tender, and covered by a layer of subtly flavoured, thick sauce. I particularly liked the sauce that was served on the side. It looked like an olive paste and it did have a subtle taste of olives, but it was more complex than that and it perfectly complemented with the fish. 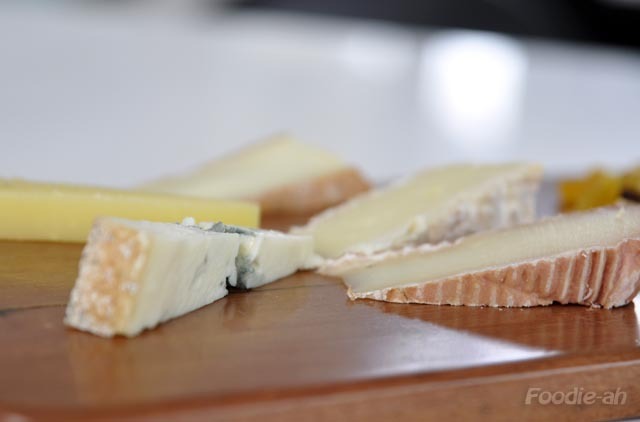 The meal ended with a Selection of French Cheese. 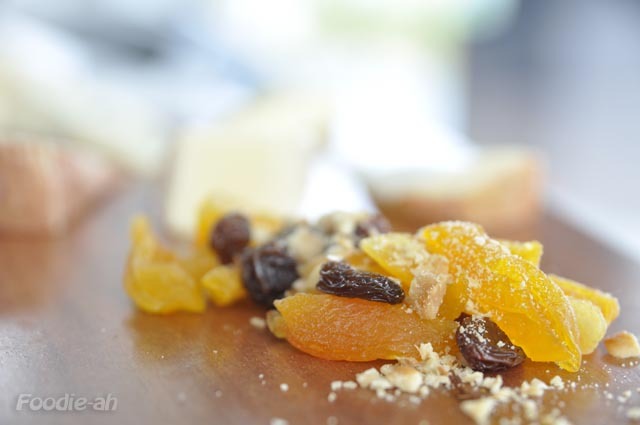 5 cheeses were accompanied by a mix of dry apricots, raisins and nuts. All cheeses were pretty good, although the "cheddary" one was the one I enjoyed the least. I thought the small pieces of apricot were a very good match. The meal cost $81.35 in total, including a bottle of sparkling water. I consider this an excellent price for a meal of this caliber. 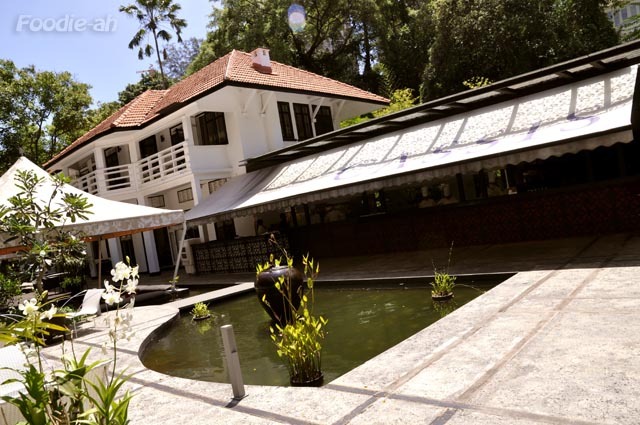 Overall Braise is still a very good restaurant, offering good food at a reasonable price in a stunning environment. The starters didn't set the enthusiasm as much as they could have done, but the mains won it back. 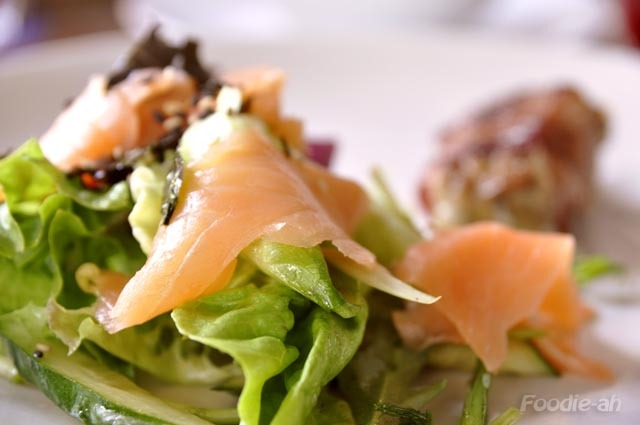 I will definitely be back to savour these dishes or others, as they are well worth it. Evan, Dave and I got together for a cooking session amongst friends. It was the first time I did this, and I am sure it won't be the last, as it was a really touching experience. We were all new to this and so enthusiastic that both David and I decided to cook 2-3 dishes each, which kept us busy for quite a few hours chatting and working together for this fantastic homemade meal! Everyone gave their best and it was a revelation. I didn't know that Evan was a professional dessert maker, and her dessert definitely exceeded my expectations. It was a refined delicacy that I would have expected to find in the best dessert shops in Singapore, in the order of magnitude of Obolo or Canele'. I also learnt a lot from David, who showed us some molecular cooking techniques. He made truffle sand to accompany the scallops, and also made a very classic dish with a twist, which I have to say was executed to perfection. Overall, I am looking forward to our next gathering. There is a lot more to learn, and a lot more fun to be had! 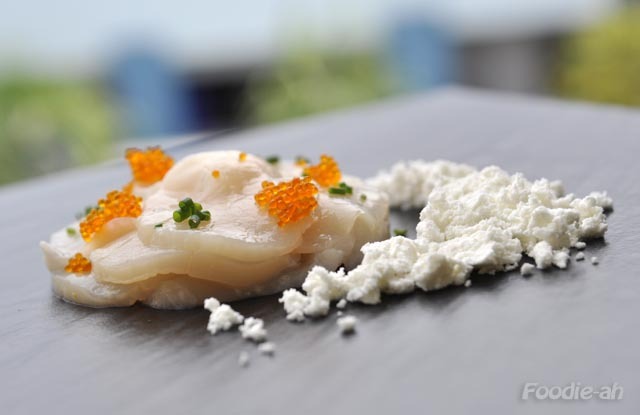 David's beautiful raw scallops with truffle sand and tobiko on top. The truffle sand melted in your mouth releasing the truffle scented oil, while the scallops had a subtle zesty kick. 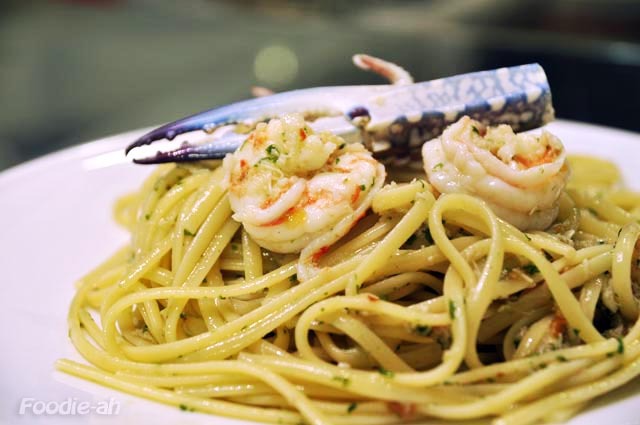 My crab and prawns linguine. I haven't blogged about this recipe yet, but I will. 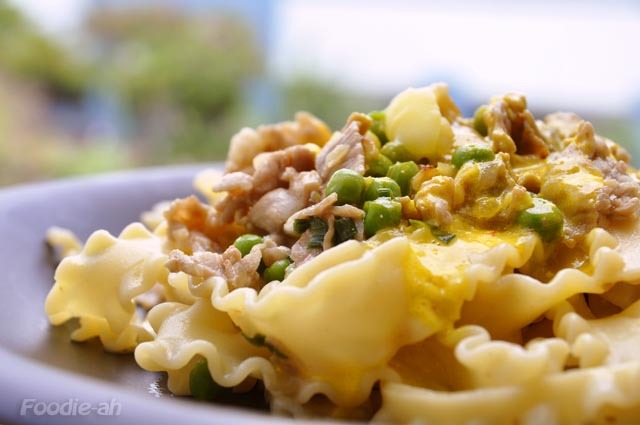 The crab meat is enhanced by the flavour of the "fumetto di pesce" created from the prawn shells. The sauce itself is made on the fly while the pasta is boiling. 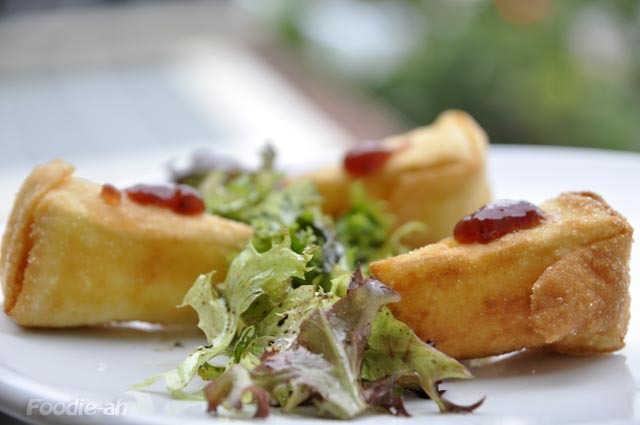 David's fried Camembert was a very classic and gnummy dish. I loved the wrapping, such a delicate replacement for the more common breadcrumb batter style... the cheese inside wasn't over melted, and it perfectly retained its texture. The combination of sweet (jam), sour (salad) and salty (cheese) was perfectly calibrated. 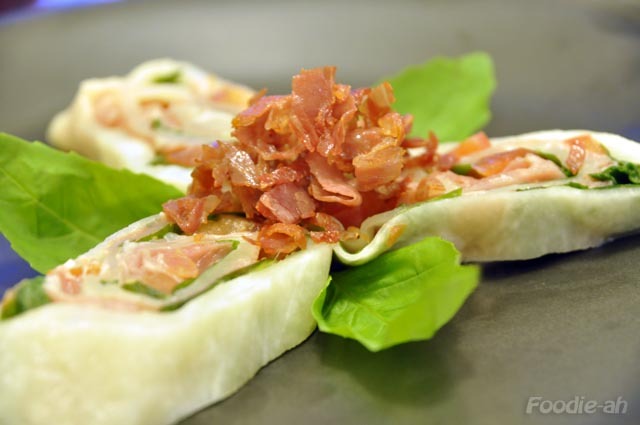 My rotolone caprese was just a quick alternative presentation of a classic Italian combination: tomatoes, mozzarella and basil - accompanied with some Parma ham, all rolled together. ...and the gran finale: evan's émotion ispahan was a complex 3-layered dessert. 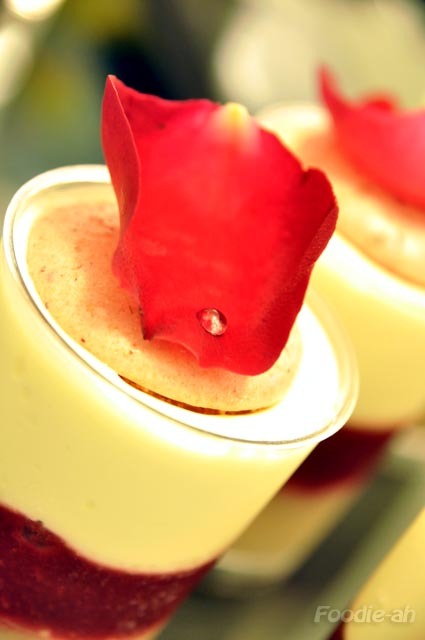 A base of lychee gelee, raspberry gelee, white chocolate cream scented with rose petals and topped with one of her macarons. Just the macaron by itself was a masterpiece. I understood then why people buy macarons from her! I would :) Initially, when she suggested making over 10 serving of this dessert I thought it would be a waste, but it wasn't. 6 of them disappeared straight away, and the rest disappeared in the following couple of days. Evan's blog is much more descriptive on this event, and she posted some great pictures too! Please go and check it out. Hopefully you will see more of these postings in the near future! I bought these two varieties of Italian cheese from Quattro Stagioni. 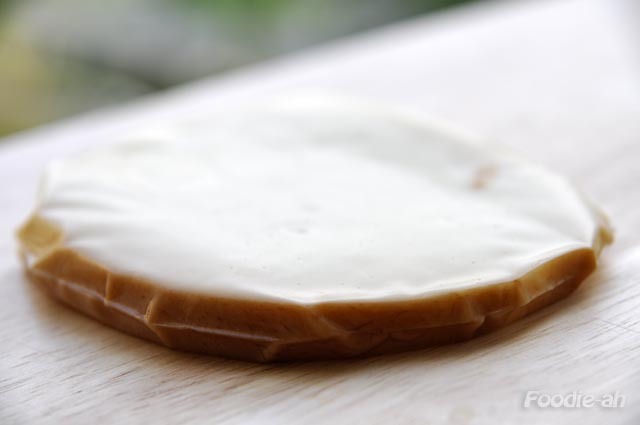 Scamorza cheese is a cow milk cheese from south Italy. 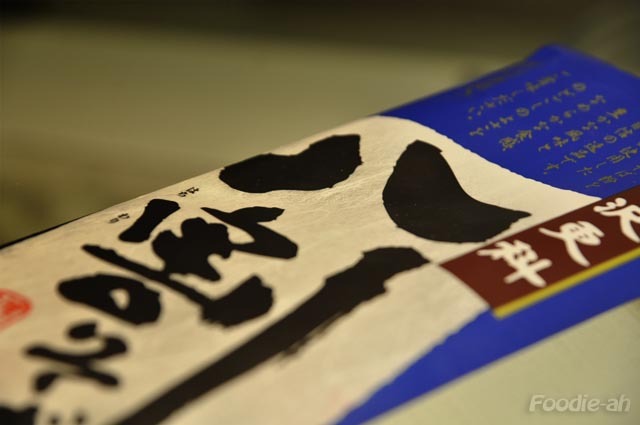 It can be either smoked or unsmoked, and I bought the smoked variety. 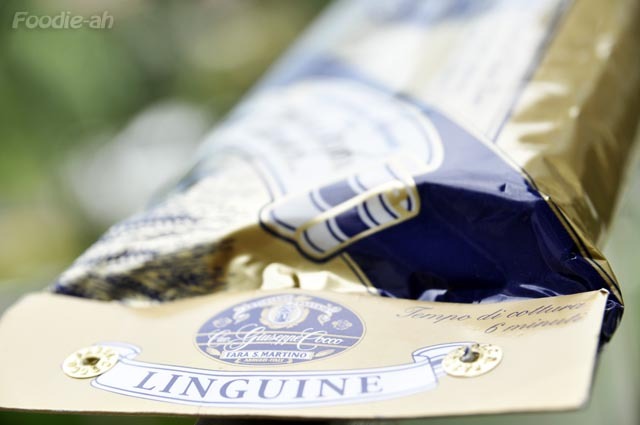 I am not crazy for this cheese on its own, but I like it when grilled and paired with classic Italian products such as sun dried tomatoes, olives, preserved mushrooms or Parma ham. I lightly grilled this on a frying pan and complemented it with strips of sun dried tomatoes. I will do this again. A well spent $4.10! 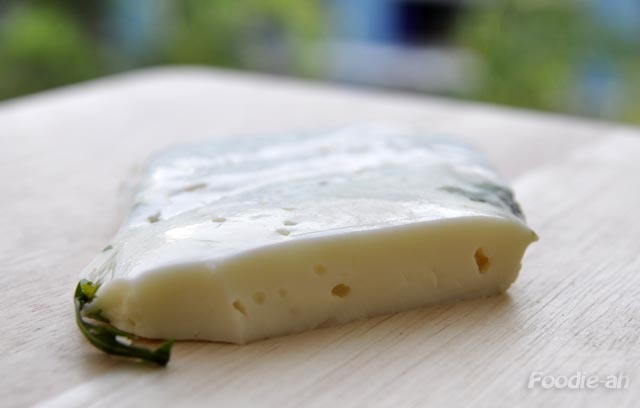 Primosale is a type of Pecorino cheese (Italian goat cheese) salted and aged for only about a month. Silky and tender in texture, its relatively simple flavour pairs a very mild saltiness with a hint of sourness. Definitely recommended to those who like fresh cheeses. As always, this is best enjoyed at room temperature, so let it rest outside the fridge for at least 15-20 minutes before savouring. Unfortunately it is quite expensive, as I paid $5.90 for a a very small slice. Unfortunately, Quattro Stagioni is now CLOSED. I have been patronizing this little Italian delicatessen located at the basement of Liang Court for about a month or so, and I believe it deserve some attention. 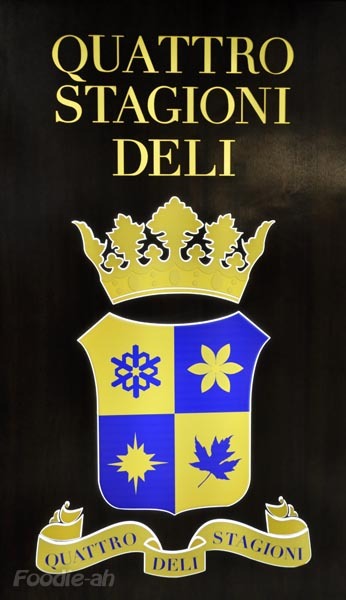 As a matter of fact, I haven't found another deli quite like this one anywhere else in Singapore. 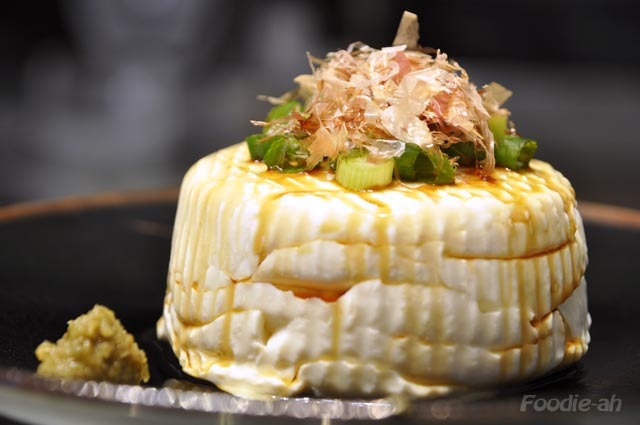 The variety and authenticity of the products they offer and the freshness of the dairy products is quite extraordinary for this corner of the world. Their repertoire of products and ingredients ranges from authentic Italian salt for making pasta to fresh "treccia di mozzarella di bufala", from niche Italian spirits like Aperol to good quality pastas. In particular, as far as I know, they are the only ones in Singapore you can by bottarga from. 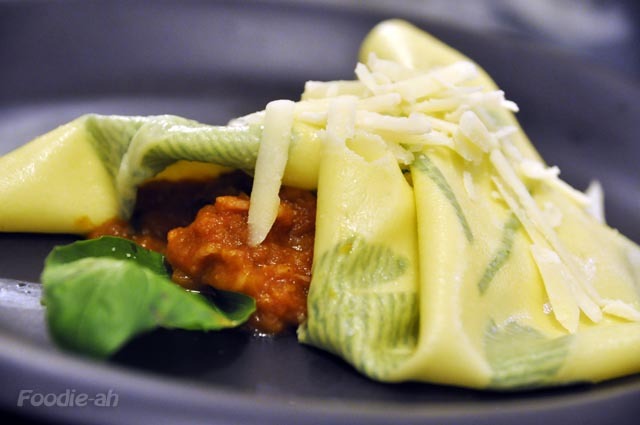 If you are Italian in Singapore, you will definitely love this place. 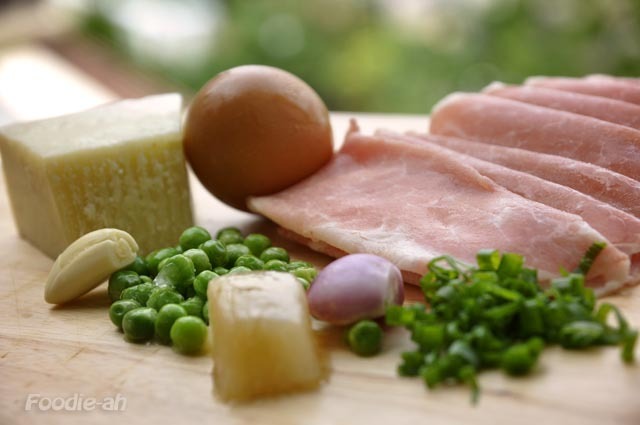 You will be able to find some of those nostalgic products you have been missing since your last trip to Italy, or a good replacement for those "compromise" products you had to utilise when cooking Italian food in Singapore. 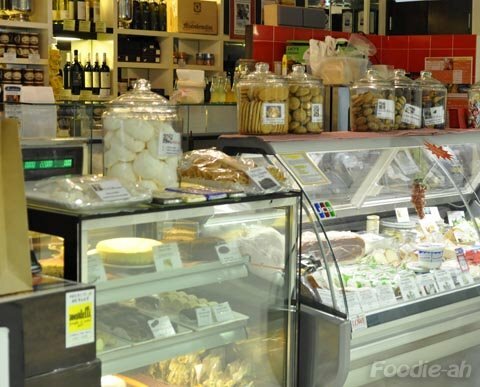 If you are simply a fan of Italian food and products, then drop by this place. I especially recommend trying their cheeses! I was at Liang Court today to do some shopping, and I decided to give the food court a try. I am referring to the food court located at the basement, next to the Japanese supermarket. I tried the donburi stall right in front of the cashiers, and I ordered a dish which I used to have quite regularly while I was in London, but I haven't been eating for years. For $11 I thought the food was just fine, as it's supposed to be: with the rice being quite moist and juicy, mildly flavoured, and the egg randomly scrambled and half-set. If you are a donburi lover, then this is a good place to eat-and-go. 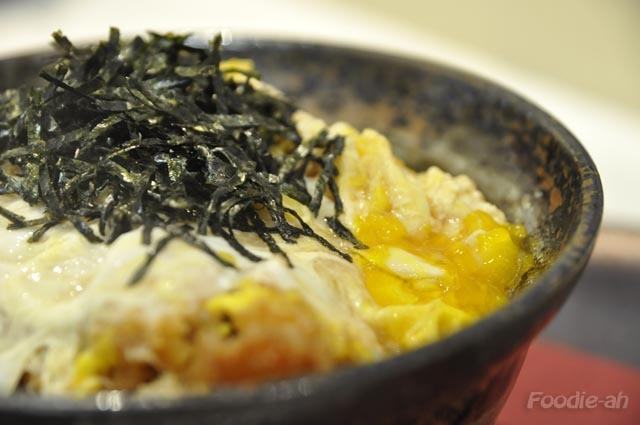 I wish they also had raw-fish donburi (like negitoro don, for instance!) but unfortunately I haven't seen those very often in Singapore. I don't think they are particularly popular with the local crowd. I finally found pasta De Cecco in Singapore at the basement of Liang Court for $2.85. I decided to test their linguine with some Mentaiko I also bought from Liang Court. I added to the recipe some spring onion (instead of the classic nori seaweed), and a quail egg. 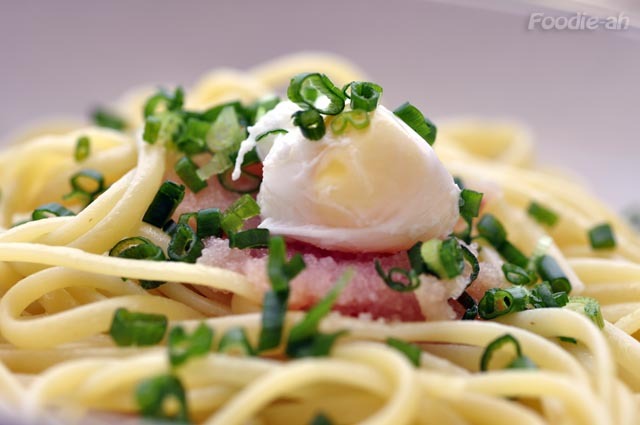 The recipe was basically a "aglio olio e peperoncino" base (the base is mostly similar to many of the recipes documented on this blog), and I added the mentaiko, spring onion and quail egg on top. The main thing to watch out for is not to add the mentaiko on top too soon, to prevent it from cooking with the heat from the pasta. Clearly, for such a simple recipe, ingredients need to be fresh and the pasta itself of good quality. I have to say pasta De Cecco didn't disappoint me, it is as good as I remembered it. 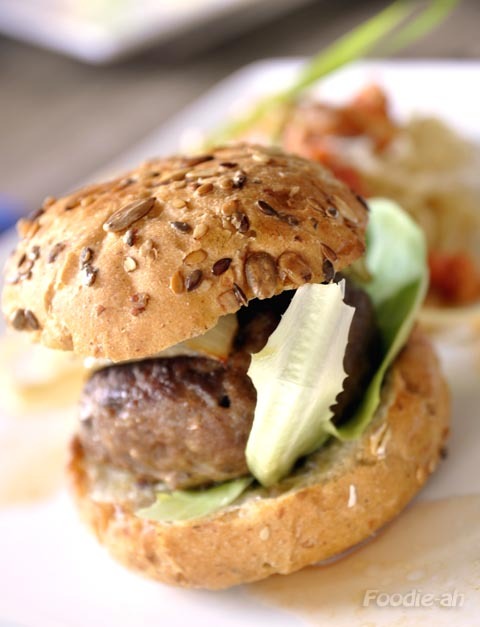 Its firm texture and porous surface make it particularly indicated for this type of recipe. If you happen to come across this brand, I highly recommend it. I think it's also sold at the Italian delicatessen located at the basement of Liang Court. For the tomato sauce, please see my sunday gnocchi recipe, as you can use the same sauce. The ingredients to make the pasta dough are not included in the list above. You can use the standard recipe (100g flour for 1 egg, a pinch of salt and olive oil). 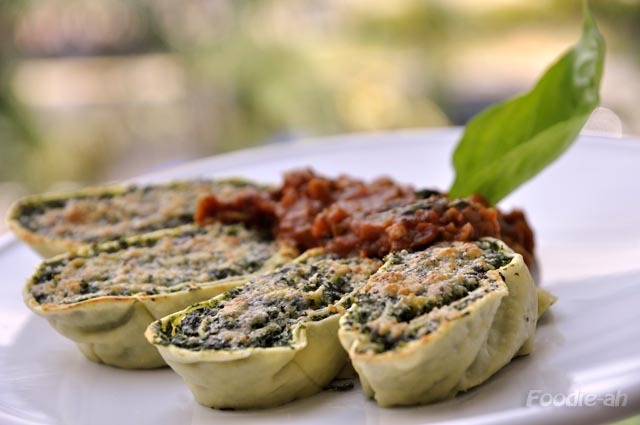 Quickly boil the spinach, remove excess water and put into a blender. 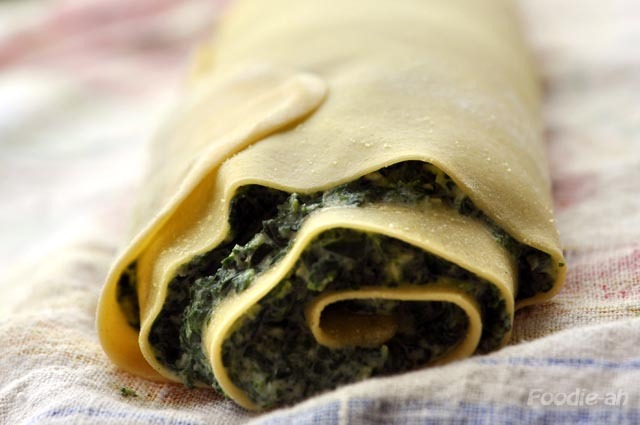 Once the spinach turned into a paste, put into a bowl together with the ricotta, some Parmesan cheese, salt, nutmeg to taste, pepper. Add some beaten egg and mix until the paste is smooth, then add a handful of breadcrumbs to make the mixture firmer. Make a couple of sheets of dough, then lay them flat and join them onto a large cloth. cover evenly with the mixture and then roll slowly and cautiously. Finally, wrap the cloth all around the roll, tie it tightly at both ends and put into boiling water for about 15-20 minutes. In the meantime, make sure the tomato sauce is ready. Remove the roll from the water, unwrap and cut diagonally into regular slices. 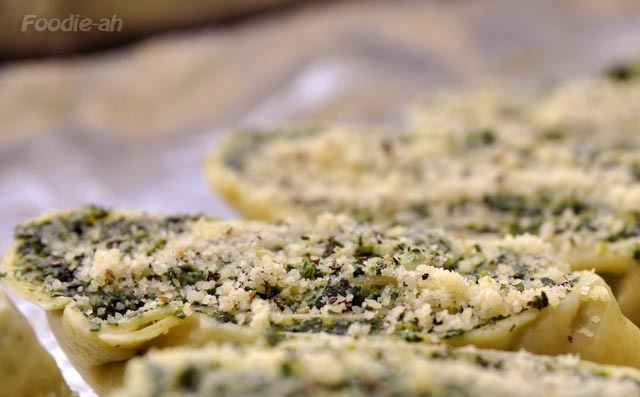 Arrange the slices onto a baking tray, cover with Parmesan and a bit of pepper (see picture above), and put into an oven on grill. Let it grill until the top is nicely brown and crispy, then remove from the oven, arrange on a plate with the tomato sauce and some basil for decoration. After a trip to Liang Court, I came back with lots of Japanese cooking goodies. I decided to make some cold soba, as I got tired with the recipes served by Shimbashi. Although I think their sobas and soup are the best, they don't offer a huge variety of cold soba dishes. 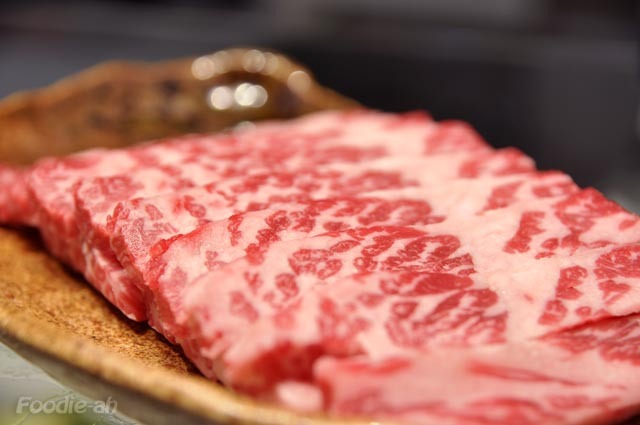 I purchased some beautiful wagyu beef and decided to use that as the main ingredient for my soba, paired with some mountain enoki mushrooms. Bring the sauce to a boil once more, then add 30g of katsuobushi, remove from the heat, wait for 10 seconds and strain. Let it cool and refrigerate until cold. Unfortunately this needs to be made a little in advance as it needs to be cooled. I accelerated the process by cooling it down within a pan of ice water, and then placing it in the freezer for 30 mins or so. It's worth noting that this sauce can be kept refrigerated for several months, so you won't have to do this every time. Wash the mushrooms and blanch them in boiling salted water. 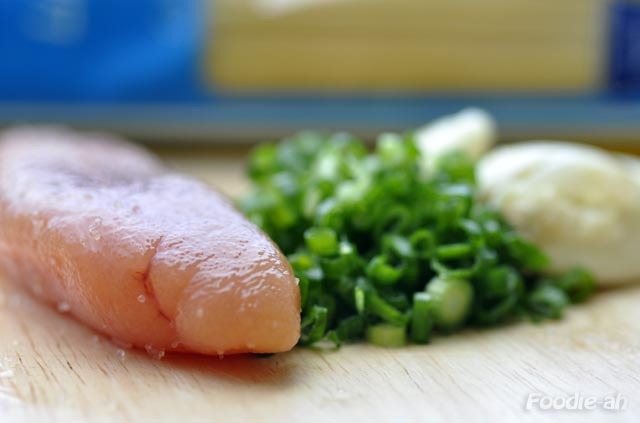 Chop some spring onions, wash the daikon and grate it finely to make a good amount of oroshi. Cook the noodles. Put them in boiling water and let boil for about 4 minutes or until cooked. Drain the water and wash the noodles under cold running water. Put them on a bed of ice and turn them now and then to keep them cold throughout. To sear the beef, I re-assembled the slices as the beef I bought was pre-sliced. I created 2 "packets" of slices by matching them in diameter and sticking them together, then i sprinkled them with salt around the outer surface. Heat a frying pan and put the "parcels" of beef on top, turning them half way through to sear both sides. I like these fairly rare, as they come out with a thin, crispy and savoury layer of cooked beef that contrasts the inner juicier part. Finally, you are ready to serve. 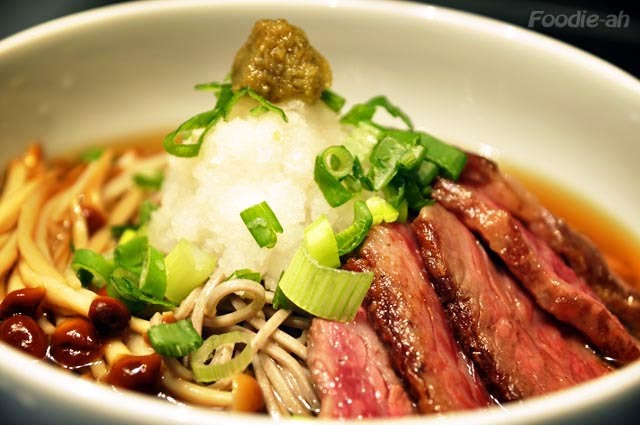 Assemble the noodles into bowls filled with the cold broth you prepared, then top with the mushrooms, the slices of beef, oroshi and spring onion. I love yuzu kosho, so I added that on top of it all. Serve with wasabi on the side. I also purchased this phenomenal yosedofu, which I prepared with the ingredients I had. It came with its sauce, so all I did was top it with some spring onion and katsuobushi, and serve it with some yuzu kosho and wasabi on the side. I think I will go back to Liang Court more often, as I have a soft spot for such delicacies! I purchased this "Fara S. Martino" linguine pasta at the basement of Central Clarke Quay, by the pasta counter. 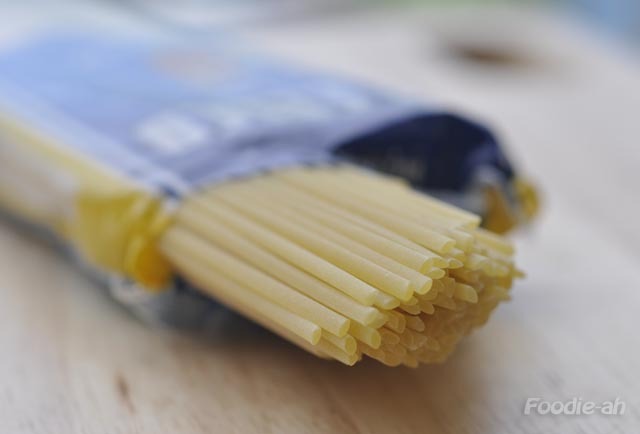 They have quite a few western products, including a good range of good dry pasta brands. "Fara S. Martino" is well known in Italy for its quality, and it's quite inexpensive. For the preparation, blanch the two tomatoes in boiling water for 20 seconds, cool them in running cold water and remove the skin. Slice into 2, remove seeds, then chop into cubes, arrange them onto a foil placed into a baking tray and bake in the oven at 200 degrees for about 15 minutes. Chop the parsley, peel 2 cloves of garlic and squash them. Peel a couple of shallots and chop them finely. 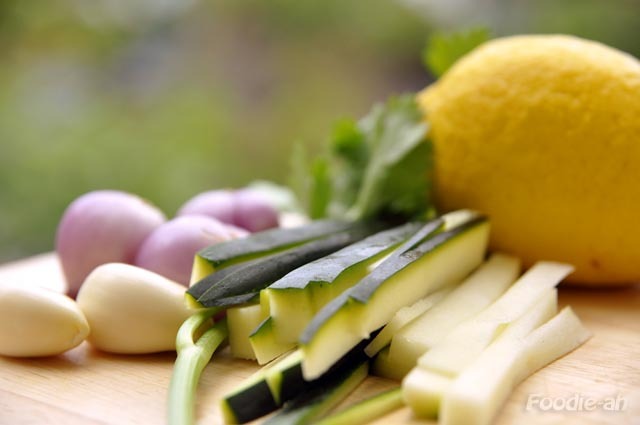 Wash the zucchini and cut them into julienne strips. Grate a pinch of lemon zest. 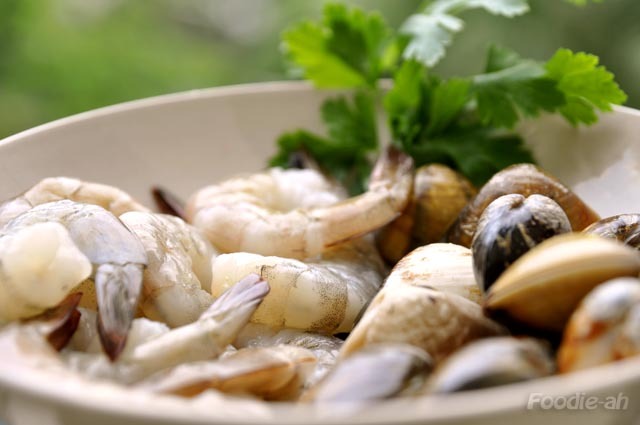 Wash clams and lightly salt the prawns. While you bring a saucepan of water to the boil to cook the pasta, heat up a skillet and start preparing the sauce. Put a good amount of olive oil into the skillet, then cook the prawns for less than a minute maintaining their juiciness (depending on their size) and put aside. Put the linguine into the salted boiling water and stir regularly while you start making the sauce. It is important that you don't let the pasta or the sauce sit aside for too long. Linguine take about 10 minutes to cook, and it should take no longer than that to cook the sauce. Add the garlic cloves and shallots into the oil, bring the color out and add some optional chili flakes. Pour the clams into the skillet and cover. When the clams start to open, pour some white wine and let evaporate quickly on medium-high heat. Add some fish stock if you have it, the parsley and a pinch of the grated lemon zest together with a pinch of salt. Cover again and continue to cook and shake the skillet until the clams are wide open. Add the zucchini and the chopped tomatoes, stir while cooking for about 30 seconds or so (depending on the thickness of the strips) and remove from the heat. When the pasta is ready, put the sauce back on the heat into a large frying pan, pour a few tablespoons of the pasta water into the sauce, drain the pasta (but not too thoroughly) and saute' with the sauce until the juices are partially evaporated to the right consistency. 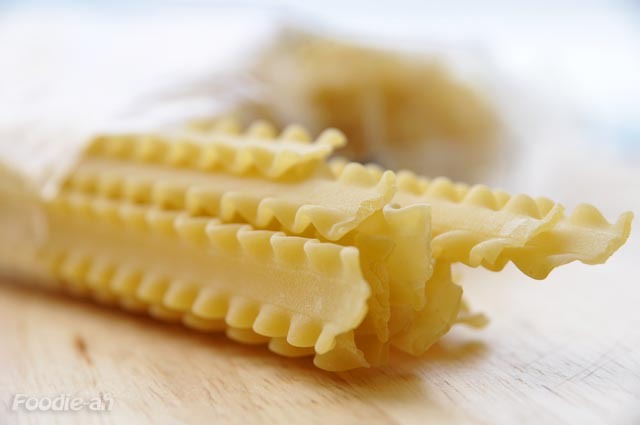 Be careful at this stage, as you don't want to overcook the pasta nor evaporate too much of the sauce or else you will end up with an overcooked, sticky pasta. Arrange on a plate and top with the prawns. I found these linguine nice and firm in texture. 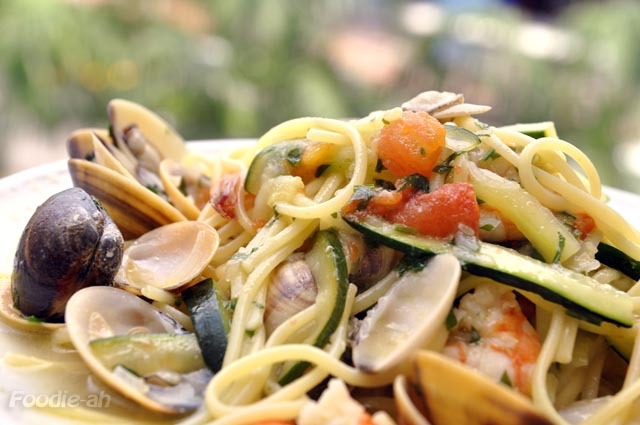 They hold well the cooking time and they are ideal for olive oil based seafood sauces. I soaked the saffron into hot water for 15-20 minutes, in order to release its aroma. I prepared a base by frying the pork in olive oil with the chopped shallots, a squashed clove of garlic and a little dry white wine. I then added the fish stock, salt, the peas and capers and the spring onion towards the end (I like this ingredient to remain fresh). I then prepared an emulsion with 2 yolks (for 2 people), a dash of wine vinegar and the saffron water. As usual, to prepare the emulsion whisk the yolks within a pot with a handle, holding the pot on the water you use to boil the pasta when it reaches boiling temperature. While whisking the yolks, add some extra melted butter/olive oil and keep whisking. Add in some hot water if the mixture becomes too firm. Make the emulsion light, dense and bubbly, then add the pecorino or Parmesan and give it one last whisk. Finally, boil the Mafalde in salted water, drain them and saute' them for about 30 seconds into the pan where you prepared the base of the sauce. Finally arrange on a plate with the pork and pees on top, and top up with the emulsion and freshly grated pepper to taste. I like the firm and curly texture of this pasta, which well combines with "rustic" sauces such as this one. I would definitely think that this style of sauce is better suited for this pasta than a tomato sauce. As a variation, I would pre-grill some tomatoes in the oven, chop them and add them to the sauce base, in order to add an extra layer of sourness. I might try that next time! Thanks to ladyironchef, we had a wonderful food gathering this afternoon and the venue of choice was Epicurious. The company was very enjoyable and the event was a success, with about 40 people attending. It was the first time I attended such an outing, and surely it won't be the last. Brad arranged a menu catered for the event, priced at $25 dollars for the dishes pictured below. He also organised a lottery, with vouchers for free dishes or 1-for-1 offers at Epicurious. Most importantly the company was great, as we enjoyed a very pleasant conversation particularly around food! Well done ladyironchef, we all really appreciate the effort you put into this to make it successful! See you all at the next food outing. Hopefully Brad will organise more of these! This is the third time I am blogging about this place, but then again it has been longer than 6 months since last time I visited it. The bad news is that they no longer open for lunch on weekends, as they used to (my old posts were Saturday and Sunday lunches). I suspect that once the big residential projects being built next door will be complete, they will generate enough demand to support this restaurant for weekend brunches. Some developments are completing soon, while others will take another year or so, therefore I don't expect their opening hours to change again anytime soon. Their menu is pretty much similar to what they had last year, except it provides much more variety. They have basically consolidated two of their old brunch menus and added some extra dishes on top of that. Please check here for their latest lunch menu. 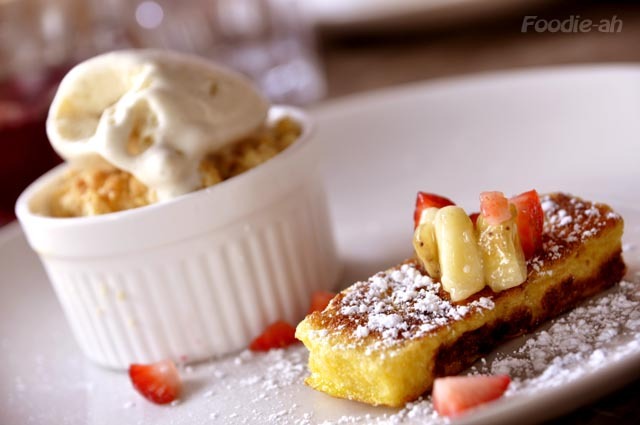 I have already reviewed most of the dishes apart from the desserts, and this time they were as good as they were at my previous visit. I won't be too detailed on the descriptions, but please check my older posts for the Saturday and Sunday brunches. 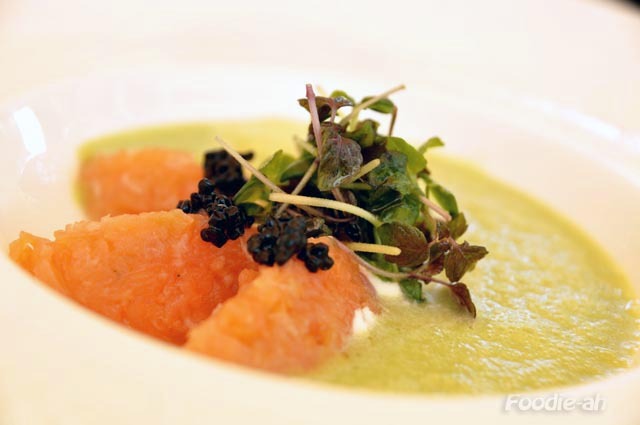 The Asparagus “Vichyssoise” with Vegetarian Caviar and Smoked Homemade Salmon Tataki was my favourite dish, with that minced raw salmon and mild asparagus creamy sauce poured on the dish in front of you. 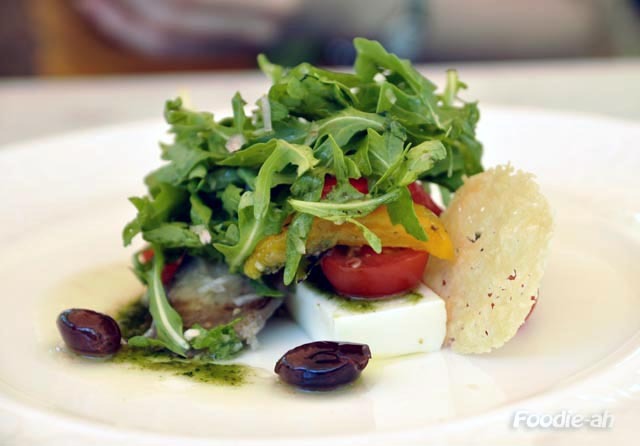 Interesting but not as special, the Mozzarella Bavarois with Pesto Marinated Grilled Vegetables and Crispy Parmesan is a light and healthy alternative for your starter. 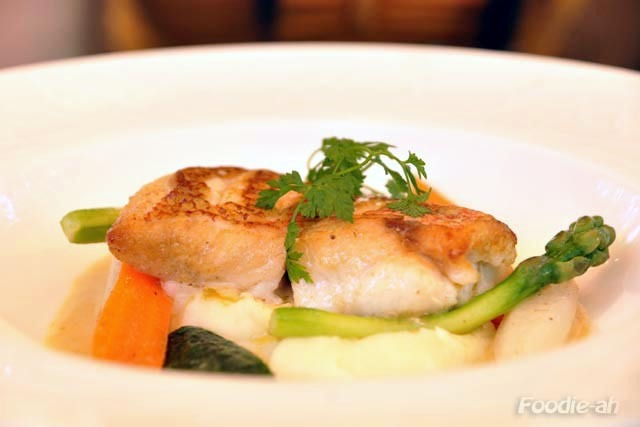 The Red Snapper Fish, Potato Puree, Glazed Vegetables, Sweet Yellow Curry Sauce was cooked and seasoned to perfection, with a mild sauce and assorted vegetables. I decided to try for the first time the Traditional Codfish “Brandade” with Green Leaves on the side. 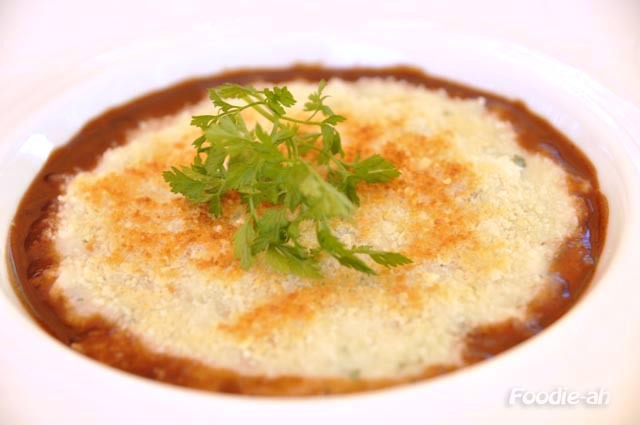 It's a gratinated mix of mashed potatoes and mashed cod, with a sauce around its perimeter. Overall not my favourite type of dish due to its nature, but nicely done in its own right. 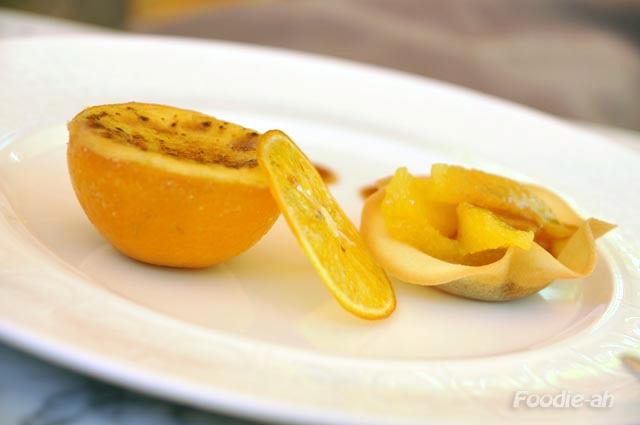 I loved the presentation of the Orange Crème Brulee served with a Caramel Sauce, as the creme brulee was served inside half an orange, while the pulp of the orange itself was presented sliced on a separate pastry cup. The creme brulee was very nicely done, balanced in creaminess and sweetness. 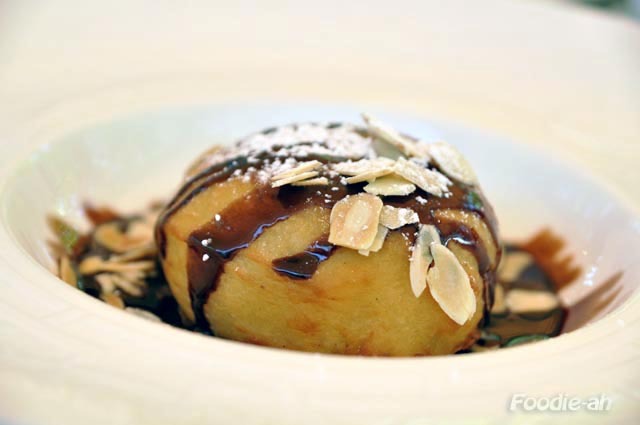 Finally, the Deep Fried Peche with Vanilla Ice Cream served with warm Chocolate sauce was a much heavier alternative. I found the batter a bit too thick and heavy for my taste. I would have preferred a thinner and lighter coating around the peach. The sauce and nuts well complemented the dish, if only the deep frying was done more 'tempura' style. The total cost of the meal was $81 including a bottle of mineral water. I still believe that given the standard of location, food and service, this remains an excellent deal and with 8 starters and 7 mains, it provides a great selection for a brunch deal. If you haven't yet tried it, you should!